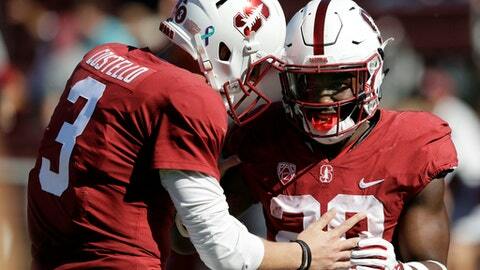 Stanford’s Bryce Love remains in strong position to win the national rushing title despite sitting out the Cardinal’s game against Oregon State as San Diego State’s Rashaad Penny ran for a career-high 253 yards against Hawaii. Love was held out of a 15-14 win over the Beavers with an ankle injury. If he returns this week against Washington State, he would have four games plus a bowl to build on his seven-game total of 1,387 yards. Penny has 1,368 yards in nine games and has three games and a bowl left. Love holds a commanding lead in yards per game, at 198.1. Zach Abey of Navy is second at 163.1. Mason Rudolph of Oklahoma State continues to be the nation’s leading passer (358.3 ypg), and Colorado State’s Michael Gallup is first in receiving (129.7 ypg). Penny ran 30 times for his 253 yards to lead five 200-yard rushers. Penny went over 200 for the second time this season and third time in his career, and the Aztecs won their 36th straight game when going for at least 200 yards on the ground. Devin Singletary of Florida Atlantic carried 36 times for a season-high 244 yards against Western Kentucky, his sixth straight game over 100 yards. Southern California’s Ronald Jones II picked up 216 yards on 18 carries, and the Trojans ran for 341 against Arizona State a week after Notre Dame held them to 76 yards on the ground. UAB’s Spencer Brown rushed 33 times for 209 yards against Southern Mississippi and broke Jordan Howard’s freshman rushing record. Brown has 909 yards in eight games. Notre Dame’s Josh Adams carried 27 times for 202 yards against North Carolina State and went over 1,000 yards on just his 110th run of the season, the fewest carries needed by a Fighting Irish player to reach the milestone. Arizona freshman Lucas Havrisik kicked a 57-yard field goal as time expired in the first half against Washington State, the longest field goal in the nation this season and tied for fourth-longest since 2013. Kansas State linebacker Jayd Kirby became the second player to force three fumbles in a game. One of Kirby’s forced fumbles set up a touchdown drive against Kansas. He became the first K-State player with multiple strips since Jordan Willis had two against Iowa State in 2015. Central Michigan’s Joe Ostman forced three fumbles against Ohio three weeks ago. Wake Forest’s 625 total yards against Louisville were its most since 1968 and marked only the second time the Demon Deacons have gone over 600. Freshman Greg Dortch had 167 yards receiving and became the third player in the nation this season to catch four touchdown passes in a game. John Wolford threw for five TDs and with 461 yards passing became the first Wake Forest QB to go over 400 since 1998. Nick Fisher became the first Colorado player to return an interception 100 yards since Steve Rosga did it against Oklahoma State in 1996. Fisher’s 100-yarder came in the fourth quarter against California. If NCAA statistical rules were the same as in the NFL, Fisher would have been credited with a 109-yard return.